The Meeple League recently announced our first online event – a league for Thurn & Taxis players – but we’re not done there. 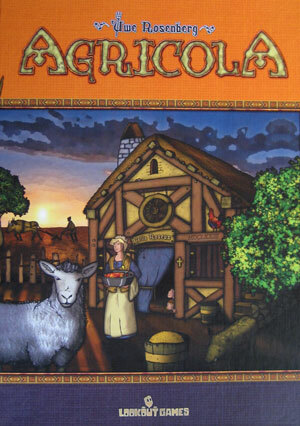 We’re also starting up an online Agricola league for those who like their Eurogames a little heavier. The format for all our leagues will be identical: players get grouped with 6 other players and put into 4 games (2 with each other player). Games will then be played asynchronously over the course of several weeks and a point system will be used to determine who wins the league (10 points for 1st, 6 for 2nd, 3 for 3rd, and 1 point for finishing last). Winning your league gets you promoted to a higher division for the next season, while finishing in the bottom 2 gets you demoted to an easier one. You can read the full rules for our league format HERE . For folks who like a complex challenge, Agricola has proven to be one of the best board games ever made. It may not draw the biggest crowds on the tournament circuit, but it is legendary for its consistently shark-infested fields. When it was first published back in 2007 it led the Spiel des Jahres committee to invent a new category (for “complex games”) so it could award a special prize, and as of this writing in early 2017 it is still the #11 overall ranked game of BoardGameGeek. 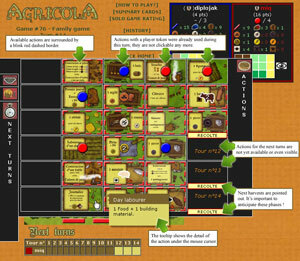 We’ll be using the online implementation of Agricola on www.boiteajeux.net. Games will be created with the Tournament mode setting (which just means the banned list used in most tournaments is implemented) and “Draft 7” will be used to distribute occupations and minor improvements from all 3 of the implemented decks: E, I, and K, though there are a few cards from the printed version of the game that have not been implemented (see the article about online Agricola). For season 1, we’ll be using BPA laurels in Agricola (see the Agricola Event History Page) to seed people into the initial divisions. You must have an account on www.boiteajeux.net to play.